Lion dance (wǔ shī 舞狮) is a form of traditional dance in Chinese culture, in which performers mimic a lion's movements in a lion costume. The lion dance originated in India. The lion is traditionally regarded as a guardian creature. It is featured in Buddhist lore, being the mount of Manjusri. 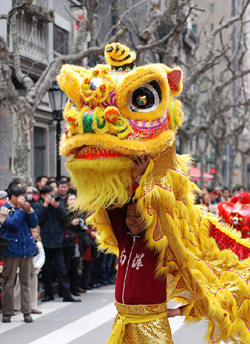 There are different variations of the lion dance in other Asian cultures including mainland China, Hong Kong, Macau, Japan, Okinawa, Korea, Vietnam, Malaysia, Sydney, and Singapore, with each region possessing their own styles. 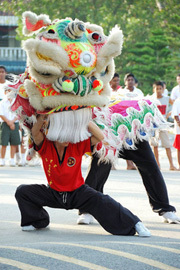 Chinese lion dances can be broadly categorised into two styles, Northern (běi shī 北狮) and Southern (nán shī 南狮). Northern dance was used as entertainment for the imperial court. The northern lion is usually red, orange, and yellow (sometimes with green fur for the female lion), shaggy in appearance, with a golden head. The northern dance is acrobatic and is mainly performed as entertainment. Sometimes, they perform dangerous stunts. Southern dance is more symbolic. It is usually performed as a ceremony to exorcise evil spirits and to summon luck and fortune. The southern lion exhibits a wide variety of colour and has a distinctive head with large eyes, a mirror on the forehead, and a single horn at center of the head. The Lion dance is often confused with the Chinese Dragon Dance, which features a team of around ten or more dancers. The Lion Dance usually consists of two people. In the north the lions usually appear in pairs, or do parkour for more felling to it. Northern lions usually have long and shaggy orange and yellow hair with either a red bow, or a green bow on its head to represent a male or female. During a performance, northern lions resemble a Pekingese or Fu Dogs and movements are very life-like. Acrobatics are very common, with stunts like lifts or balancing on a giant ball. Northern lions sometimes appear as a family, with two large "adult" lions and a pair of small "young lions". 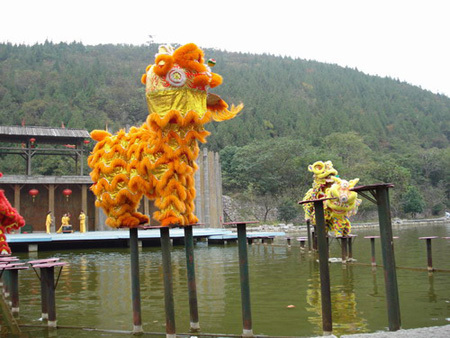 Ninghai, in Ningbo, is called the "Homeland of the Lion Dance" (wǔ shī zhī xiāng 狮舞之乡) for the northern variety. Guangdong is the homeland of the southern style. The Cantonese style can be further divided into Fat Shan (Buddha Mountain), Hok Shan (Crane Mountain), Fat-Hok (minor style that exhibits a hybrid of Fat Shan and Hok Shan), Jow Ga (minor style performed by practitioners of Jow family style kung fu, exampled by the Wong People), and the Green Lion.